If the lineup below looks quite familiar, it's because the Los Angeles Kings took the phrase "getting the band back together" pretty seriously. Los Angeles completed an incredible run to its first Stanley Cup title, then retained every player who dressed for a playoff game. Dustin Penner was an unrestricted free agent, but he re-upped on a one-year contract. The Kings did not make a big move to improve the club, but general manager Dean Lombardi has a roster full of Cup winners and plenty of salary-cap space to work with, according to Capgeek.com. Lombardi's biggest move of the offseason was locking up Conn Smythe Trophy winner Jonathan Quick with a 10-year, $58 million contract. There are some intriguing prospects who might be ready for full-time NHL duty, but it is going to take injuries for them to get a chance during the early stages of the season. 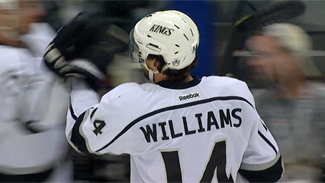 Under-valued: Justin Williams – While there are plenty of big names among the Kings' forwards corps, Williams flies under the radar in fantasy drafts, but he clearly shouldn’t after averaging 22 goals, 58 points, plus-12, 52 PIMs, 16 PPP and 227 SOG over the last two seasons. Over-valued: Simon Gagne – Still remembered for his 40-plus goal seasons in Philadelphia, Gagne is likely a third-line forward for L.A. and had just seven goals and 17 points in 34 games last year -- between his injury history and disappointing stat lines over the last three years, he’s not worth a draft pick. Sleeper: Slava Voynov – Despite quiet playoff production (one goal, two assists), Voynov has potential to build off regular season totals (eight goals, 20 points, plus-12 in 54 games) and develop as Kings’ second most valuable fantasy blueliner behind Drew Doughty. NOTES: Not only does coach Darryl Sutter have everyone back from a lineup that was essentially the same for every playoff game from the middle of the second round on, but Gagne is healthy and could be primed for a bounce-back season. Those top two lines were so effective in dispatching the St. Louis Blues, Phoenix Coyotes and New Jersey Devils once Sutter moved Penner to the second unit that it would certainly make sense to start this season with that alignment. Gagne could be a top-six forward, but he might have to settle for third-line duty with Stoll and possibly playoff goal-poacher King. This lineup doesn't even include Andrei Loktianov or Kyle Clifford, let alone prospect Tyler Toffoli. Any of those players would probably see regular minutes for a lot of teams. The defense was aligned in the same way for virtually the entire postseason, and Quick logged every minute in net. There has been some speculation about the Kings trading Bernier, but Lombardi doesn't have any particular needs at this point. If the Kings do need cover on defense, prospects Jake Muzzin and Thomas Hickey are likely ready for a chance to prove they belong in the big leagues. If Bernier does get dealt, Martin Jones could be ready for NHL duty in his place.